English: Air-to-air photography of a T-38 Talon in supersonic flight over the Mojave desert reveals air density changes caused by flow regime transition around the aircraft, and the turbulent exhaust of the aircraft’s jet engines. This photo was acquired using a technique named Air-to-air Background-Oriented Schlieren (AirBOS). The process involves imaging with a high-speed camera mounted on the bottom of a Beechcraft B-200 King Air aircraft while the T-38C passes underneath. 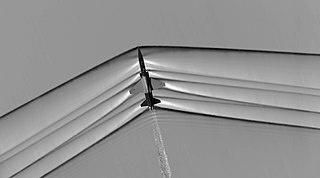 The pattern formed by the desert ground underneath the aircraft is filmed separately, and then removed digitally from the captured images during post-processing This reveals the distortions created by the shockwaves, which result from the change in the air’s refractive index caused by density changes.